There were only 2 things with this movie that I didn’t like. The first being the title. Kind of gave away the ending. It’s called Lone Survivor not We All Lived. The second being that the movie opened with the soldier who survived. Not giving it away, but it was pretty obvious who it was. Still, I would’ve rather have been surprised. The movie was based on a real life mission in 2005 about 4 soldiers deployed to stop a Taliban leader, Ahmad Shah. Mark Wahlberg has an incredibly badass performance as Marcus Luttrell. All the actors give it their all and would make the soldiers they portrayed proud. Sadly again only one character made it out alive. There is a lot of buildup at the start of the movie. Even though most scenes are gun fights, there is a lot of build up to the first shots being fired. We are shown the soldiers at the military base relaxing. Danny Dietz (Emile Hirsch)spends the opening scenes looking at wall paper pattern that he and his wife are deciding on. Matt Axelson (Ben Foster) sends cheesy emails to his wife and tells her “I’ll talk to you in a few days. Gotta go to work,”. Michael Murphy (Taylor Kitsch) debates what a bridesmaid is to Luttell and explains his wedding plans. Even the minor characters had backstory, which makes it even sadder. Shane Patton (Alexander Ludwig) is an aspiring solder waiting to be deployed into the fight. There are moral aspects to this movie and makes the viewer think “What would I do in that situation?”. As the four soldiers have Shah’s Taliban town in site, a group of goat herders stumble upon them. 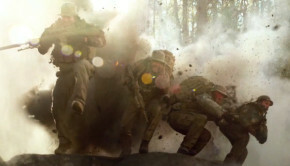 The Soldiers are faced with three options laid out by Murphy. “1. Either we let them go. 2. Tie them up and they’ll probably wolves will get them or freeze to death.3. We terminate the compromise”. *I will be writing an extensive article on this moral dilemma later on in another article. The men decide to go with option 1 and hightail it out of there and decide to fight Shah another day. They don’t get far before the firefight begins. Even through the four men are highly trained soldiers, the numbers are hysterically not in their favor. The men, after all being shot multiple times, decide to run. The scene that follows is what I call The Most Brutal Falling Scene Ever! It’s amazing three of the four didn’t die in the falling scene. We’re talking rocks, trees, and snakes. Yes, when Luttell awakens and regains his senses, a giant snake is right in front of him. From that scene on its all action, followed by a little peace and quiet, followed by more action. This movie didn’t disappoint at all for me. I do disagree with only sending four soldiers. Yes, more were waiting for deployment at the base, but you can ask so much of only four people. This movie gets an easy 5/5 and makes me want to pick up novelization written by Luttell. What makes this movie even more amazing is that it’s a true story. Hard to believe that these men were put through all of this and one came out alive. The tag line of the movie poster sums the movie up perfectly “Based On True Acts Of Courage”. Why are there humans on Mars? How did John learn to walk so quickly? Why does the bad guys plan not make any sense? Why didn’t John bury his wife and child in the same grave? How did John fall for the Martian woman so quickly? Why does the Martian queen look so much older than John? Why do the Martians seem shocked that Earth has water while Mars equally has water? Why did the magic dudes even go to Earth in the first place? The story is about John Carter, a Civil War veteran, who has been transported to Mars and fights a galactic war on the red planet. Since the gravity is lesser on Mars, John is like a superhero. He can leap tall distances in a single bound. More powerful than a locomotive. And most importantly, can dazzle the minds with his idiotic discussion making skills. For some reason, not questioning it, some magical super people come to Mars and try to run it by corrupting the leaders and starting a war. John is transported to the red planet and is found by a tribe of 4 armed aliens. You know what, I don’t even feel like writing about this anymore. This movie was God awful. The storyline constantly doesn’t make any sense. The magic guys want this dictator to marry this queen just to kill her. That’s the main storyline to this overall disappointing movie. This movie gets a 1/5. Even with all the special effects and action scenes, this movie was still terrible. There is nothing that saves this movie. Don’t see it.